Hi guys, today we will be doing something a little different. We’re going to split the review of the Undone custom Aqua into two! In this first part, I’ll be talking about Undone as a brand, as well as my experience with the customization features on their website. Undone has kindly offered me the chance to craft my own watch, and I’m absolutely stoked! For now, I’ll be reviewing the customization process that’s offered on their website, here. Undone is a watch brand based in Hong Kong, and describes themselves as “the world’s leading custom watch label, founded by a team of dedicated watch industry veterans, craftsmen, designers and programmers.” I first came to hear about Undone through their highly successful customizable retro watch Kickstarter campaign, which raised close to $2 million HKD, or around $350,000 SGD! That’s a mind-boggling amount, one that attests to the attraction of customization. The idea that you can build a watch according to your preferences is clearly one that many (including me), love. 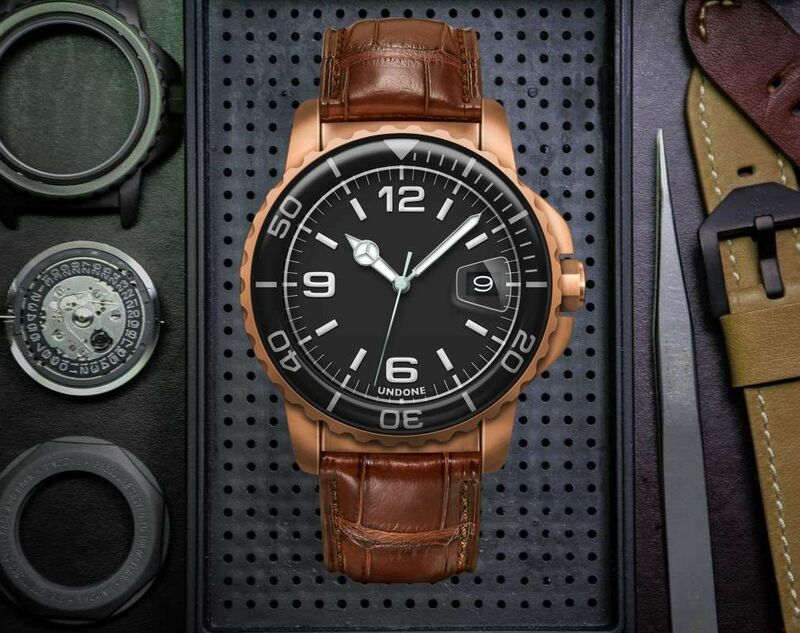 Undone allows everyone to build their own take on their ideal watch. I really like the Undone brand ethos – with Undone, I feel like I clearly know what the brand stand for. I’m inferring that the name comes from Undone’s belief that what they are doing are unprecedented – democratizing custom-made products. Undone believes that luxury is not about designers labels and branded logos (ahem, Supreme? ), but rather that luxury lies in getting things tailor-made to your exact preference. I totally agree with this – I have never understood why people would spend thousands of dollars for a mass-produced shirt, just because it has the Supreme logo on it. In the fashion industry, getting things custom-made (be it shoes or suits) tend to cost a pretty penny – I admire Undone for being able to offer their customization services at a relatively reasonable price. The fact that all Undone watches are hand-assembled in their facility makes them even more remarkable. Without further ado, let’s build our custom-made watch! When I saw the amount of customization available, I was like a kid in a candy shop! Honestly, I think I wasted 1-2 hours of my life (in a good way) tinkering around with different combinations. First we start by choosing the case material. You can choose between stainless steel with PVD coating (Rose gold, gold, grey, silver and black) or a cerakote coated case with matte sand finish. When I saw the cerakote option, there was no doubt in my mind that that’s what I’m going for. Cerakote is a coating traditionally administered to firearms (yes, guns!) to increase wear, corrosion, and chemical resistance, as well as general hardness and strength. If your watch is cerakote coated, your watch is highly likely to be tougher than you are. I chose the white version of the cerakote coated case because I don’t have a white cased watch currently, and the fact that I think it would look helluva cool. For the bezel, I went with the white cerakote option as well. Undone offers you the choice between ceramic, K1 glass (which is glossy), and cerakote bezel. Again, I chose cerakote because of it’s toughness and resistance, as well as it’s matte looks. It’s understated, yet tough – something that I feel reflects who I am! The dial where I spent the most time fooling exploring around. There are just so many options! There’s your usual matte and glossy dial, a full lume dial, sunburst (here classified as sunray) dials, even something called Aqua 1960, which I infer is Undone’s take on the vintage diver dials. There’s even a camo option, though I’m not sure who would put a green camo dial on a divers. I would have loved to see a blue camo option here though – this is a diver’s watch Undone, how can you offer a pink camo option but not a blue one? I eventually settled on the carbon fiber dial, which I felt complemented the cerakote case and bezel well. Both cerakote and carbon fiber are immensely resilient materials – a perfect match in my opinion! Undone also allows you the option to put your own text on the dial – I decided to include my own initials. I wish there were more font options though. My main complaint here would be that I wish there was a way in the stock customizer for me to have the carbon fiber dial without the cyclops lens. I’m not a fan of the cyclops lens – whenever I see one, I immediately think Rolex knock-off. I think you can email Undone about modifications that’s not offered in their stock customizer, but I believe that would entail extra fees. Anyway, I’m not talking about adding my own logo or indices here – I believe the optional choice of Cyclops lens should be made available for all dials. For the minute and hour hands, I went for sword markers, in rose gold. I admittedly struggled with this – the silver/black markers were more in keeping with the color theme, but felt a little bit…conventional (boring). I eventually settled for rose gold hands to add a little pop of color and luxury on the watch. I also went for the ball-end seconds hand (in rose gold) for a bit of a vintage look. I was really impressed by the amount of strap options available – this has to be the most comprehensive strap options I’ve seen offered, by far! I went for a US Horween Oil Tanned black strap with white stitching, which I felt complemented the watch extremely well. Horween leather are known for their quality – I must admit I was very excited when I saw this option. Oh, I forgot to mention – the movement here is a Seiko NH35A. Variations offered are no date, black date, and white date options. As can be seen above, I went for the white date dial option. And finally, Undone offers you the option of either a solid or exhibition caseback, with engraved text and images of your choice! After some consternation, I decided to have an image of a Gryphon engraved on an exhibition caseback. The Gryphon is the symbol of my alma mater, a place that molded me to become the person that I am today, as well as where my best friendships were forged. It’s not something that I think about everyday, but it’s something that will always be at the back of my mind. To have the Gryphon engraved on the caseback of the watch just seemed incredibly fitting and apt. Conclusion (for now) – so is Undone customization “shiok” or not? Yes – I really had a blast with Undone’s customization tools. Since Undone has launched the Aqua, there has been other companies offering custom watch services (like Eoniq) but as of now I don’t think any company has as extensive an offering as Undone do here. As aforementioned, my only quibbles are that the choice of a cyclops lens should be extended to all dial options, and I wish there were more font options, as well as a blue camo dial. But overall, I really had a lot of fun putting together a watch that I felt reflected my personality, and meant something to me. To me, that’s the point of a watch. Can’t wait till I receive it – will review it in-depth then! For those interested, Undone also has a customizable chronograph line (some vintage inspired), so check that out as well. P.S If you haven’t already, do follow my social media channels on Facebook here, and on Instagram here.